Filled with colorful details and rich with photographs of the author's life, It Is Written is a beautifully written page-turner about how one person turns the raw materials of life into art. Over a thirty-year career as a published author of fiction, poetry, and essays, Philip Lee Williams has become one of the South's most-honored writers. From his first published novel in 1984 until now, he has been a steady presence in the literary world. In addition, he is an accomplished composer with more than eighteen full symphonies, an opera, and a requiem mass to his credit. 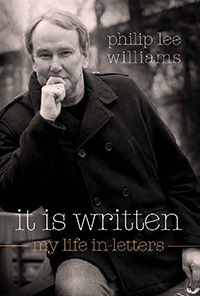 Now, Williams tells the story of his creative life in an open, jaunty, and often hilarious autobiography. The book starts with the story of a notorious party in New York City in 1991 and then backtracks to Williams's early days living in the country outside Madison, Georgia, where his father was principal of Morgan County High School. While the book has plenty on Williams's youth in Madison, his days as a student at the University of Georgia, and his later years as a journalist, it focuses primarily on his career as a published writer, beginning with his first novel, The Heart of a Distant Forest. Along the way, it dishes inside information on Hollywood and the publishing business itself, and is filled with high good humor, bizarre detours, and a quiet sense of accomplishment as a major writer in the South.